Why did a "secularized" concept of messianicity seem so crucial in the twentieth century? 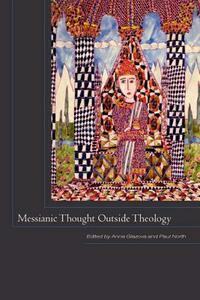 Are messianic structures intelligible outside the theological systems in which they were invented? This book seeks to situate the ethical, ontological, and literary adoptions of messianism within the broader contours of messianic thought. The gesture by Benjamin, Rosenzweig, and others of detaching messianism from the person of the messiah, understanding it instead as a redemptive potential inherent in all human history, is one facet of a broad move in political theory, philosophy, linguistics, and historiography to redeem secular thinking through theological figures. Yet already within religious discourse the messiah figure is paradoxical. With the invocation of a future arrival "to come," history is opened, yet the previous assumption of an end threatens to shut it off from whatever unexpected might come. The coming arrival, so certain, so complete, will have already come in an anteriority that seems to cancel the future and close down historical life before it starts.